Every adoption story out there is different from the rest, but most of them (at least in the US) can be categorized into four different types of adoption: International, Foster Care, Private Domestic, and Embryo. Let’s explore all four. As it’s name indicates, international (or intercountry) adoption is the practice of adopting children from different countries. International adoption is, in most cases, the most expensive adoption route. The rules for adoption vary widely between different countries open for foreign adoptions from the United States. A lot of controversy surrounds international adoption as people worry that a western “demand” for adoptable children increases the risk of child trafficking. However, approximately 8 million children live in institutional care with no hope of being adopted within their own country. Statistics indicate that of the children who graduate from institutional care, the majority turn to crime and prostitution. Approximately 1,530,000 orphans are available for adoption by American citizens. For these children, international adoption may be their only hope of finding permanent families. International adoptions can take anywhere from 1 to 10+ years to complete and cost an average of $30,000. Around 400,000 children live within the United States foster care system. Of those children,over 100,000 are waiting to be adopted. Adoption through foster care is the most affordable way to adopt, though it also results in the highest level of governmental involvement. It generally takes a year to have a a child placed in a family adopting through foster care and costs between $0 and $1,000. Private domestic adoption usually occurs when a birth mother decides she cannot adequately provide for her baby and chooses to create an adoption plan. These adoptions can be closed (the adoptive family knows nothing of the birthmother and vise versa), semi-open (some information is exchanged between the two parties), and open (long term contact is maintained between the birthmother and adoptive family). While the birthmother sometimes asks an agency to select an adoptive family for her, often the birthmother looks through prospective families’ files and makes the choice herself. Voluntary newborn adoption generally costs between $10,000 and $30,000. The typical wait is one to two years. I don’t know much about this one, and I’m still trying to decide what I think of it. If you have opinions, I’d love to hear them! Leave a comment. I first learned of it on the Nightlight Christian Adoptions website while putting together the Resource page for TIO. If you want to learn more, you can visit Nightlight’s Snowflake Embryo Adoption page. NOTE: Younger teens, please check this with your parents before clicking. Thanks! 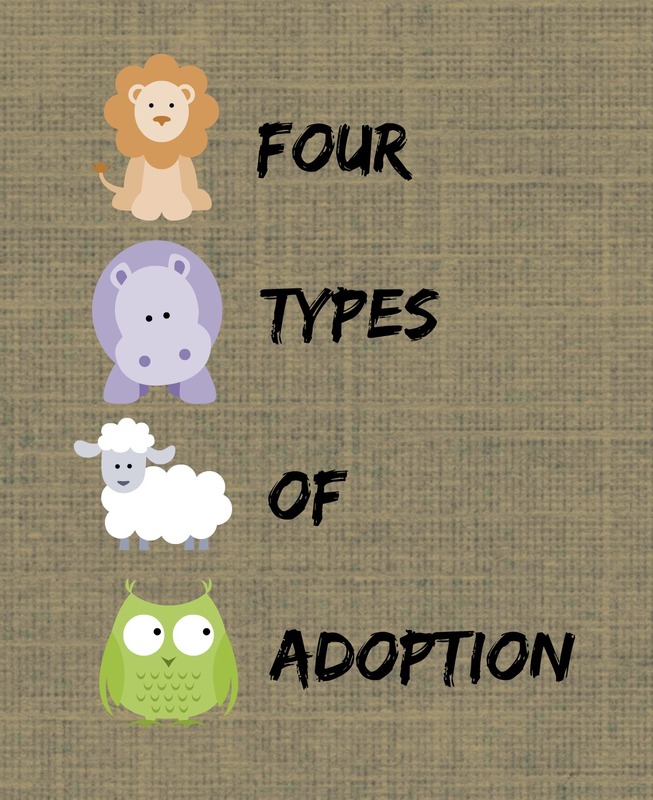 Originally posted on May 30, 2014 as Understanding the Four Types of Adoption. I just heard about Embryo adoptions for the first time myself. It’s a fascinating idea!